In my humble opinion, Patrick Laine and Auston Matthews are the two best rookie forwards in the NHL this season. Another game, another great effort by Auston Matthews. However, the fact remains, they're the same old Toronto Maple Leafs that can't hold a lead. Once again, they score four goals and then blow a four goal lead. Laine scored his first ever career hat trick including this beautiful game-winning goal to sink the Leafs. In three games, Laine has scored (4g-2a—6pts). The Miami University RedHawks will be minus another top player. Monday, 19-year-old forward Jack Roslovic signed a three-year, entry-level deal with the Winnipeg Jets. Roslovic was drafted 25th overall in the 2015 NHL Entry Draft. More than likely, during the 2016-17 season, Roslovic will play with the London Knights of the OHL. Told that Jack Roslovic has signed an entry-level deal w Winnipeg. @nhljets #nhljets He's done at Miami U.
I found this story to be very interesting and thought provoking. The Winnipeg Jest aren't going to ban fans from wearing Indian headdresses. So they say... We will be following this to see how it plays out. So, if the Jets decided to start banning people from the arena for wearing head dresses, would they be violating a Canadian fan's freedom of expression? Tiar Wilson, CBC News - The staff at MTS Centre in Winnipeg will be on the lookout for fake headdresses as they let fans in for the hockey game tonight between the Winnipeg Jets and the Chicago Blackhawks. Headdresses are not banned, but if someone arrives wearing one, "We would have a conversation with them and we would make them fully aware of the ramifications of wearing that and the cultural ramifications of it," said Scott Brown, senior director of corporate communications for True North Sports and Entertainment, the Jets owner. This past spring when the Jets last faced the Chicago team in Winnipeg, a Blackhawks fan sported a fake headdress in the stands. Jordan Wheeler, a longtime Winnipeg Jets fan and season ticket holder, filed a complaint with the Jets owner, True North Sports and Entertainment. He wanted the team to ban headdresses at hockey games. Hum, I am thinking of a comparison here. Can you think of one? A headdress is sacred to First Nations, worn by chiefs or those who have earned the right to do so. Wheeler, who's Cree from the George Gordon First Nation in Saskatchewan, says no one — whether First Nations or not — should be allowed to wear a headdress to a hockey game, especially while carrying beer. At the 03:08 mark of the second period, Winnipeg Jets defenseman Dustin Byfuglien punched Anaheim Ducks forward Corey Perry after he had scored a goal against the Jets. Not a very classy act and I'm sure the league will take a look at this incident, but I don't see a suspension coming. Winnipeg Jets defenseman Dustin Byfuglien has a hearing with the NHL's Department of Player Safety for his dirty cross-check on the Rangers J.T. Miller. There was no penalty called on the play. First, there's no way you can defend a dirty hit like this. There are players that play hard-nosed hockey, but this is down right bush-league. Byfuglien's hearing in a phone hearing, so his suspension won't be more than five games. Winnipeg's Dustin Byfuglien will have a hearing tomorrow for cross-checking NY Rangers forward J.T. Miller. #NYR HC Alain Vigneault: “Violent,deliberate. Could have broken his neck. It was one of the most vicious cross-checks I've seen this year." Check out this legal, hard, crisp shoulder-to-shoulder check by Winnipeg Jets defenseman Dustin Byfuglien. Big Buff absolutely blows up Luke Gazdic wth a monster check. I hurt just watching the video. There’s been a lot of ink written on Evander Kane as of late. Now we find out that he’s going to have shoulder surgery on Saturday and be out 4-6 months. That’s a bad break for the Jets. It also sounds like the Jets could have a bit of a mess in the locker room right now. I wouldn’t be shocked if Kane has played his last game in a Jets uniform. Chris Johnston, Sports Net -- Earlier in the day, the 23-year-old winger is said to have had a run-in with teammates. Kane wore a track suit when the Jets players gathered that morning for a meeting — a violation of team policy. Following a brief workout and stretch, Byfuglien is believed to have thrown those clothes into the shower to send a message to his teammate, according to sources. Byfuglien spoke with reporters on Thursday before Sportsnet’s report surfaced and was asked how Kane’s absence from the game would affect his status inside the dressing room. Is Evander Kane on Trading Block? It appears so, check out what's making its way around the blogosphere today. I can think of a couple of teams that he would look good on. You have to wonder if Kane could use a fresh start? Many questions around Evander Kane and the Jets. Some medical issues to be resolved, but teams are calling and Jets are listening...hard. Further to @DarrenDreger's tweet, also hearing Jets taking calls on Evander Kane. Big name to have on trade market for sure. This is a story that has garnered a lot of attention the last few days. To me, it seems a little excessive, but team rules are team rules. Right? On the surface it appears minor, Kane wore sweats to a team meeting. Here's what at stake, Kane broke team rules and if the coach hadn't disciplined him, it would appear that the coach has two sets of rules. One set of rules for star players and rules for the rest of the team. Gary Lawless, Winnipeg Free Press --- Kane’s transgression on Tuesday, as it turns out, was fairly was minor. He broke dress code, arriving at the rink for a midday team meeting in sweats, instead of a suit. By gametime, Kane wasn’t a player. Jets coach Paul Maurice scratched Kane from the lineup and after the game called it a coach’s decision. This is the second time Maurice has made Kane a healthy scratch for disciplinary reasons. The coach has rules and he expects his players to follow them and there are few exceptions. The margin of error for a repeat offender such as Kane is thin. So he got benched. It will be interesting to see how the NHL responds to this moronic cross-check by Chicago Black Hawks goon Dan Carcillo on Winnipeg Jets forward Mathieu Perreault. Apparently, the Jets aren't very happy with this bush league cross-check, either. Frankly, I don't blame them. Perreault left the game with an injury as a result of this dirty hit. Personally, I don't have a problem with goons, but Carcillo is a hockey player that we could do without. Ken Wiebe, Winnipeg Sun -- But the fallout from Friday's game includes the loss of red-hot Jets forward Mathieu Perreault to an apparent arm injury after taking a vicious slash from Blackhawks winger Daniel Carcillo late in the second period. Carcillo received a slashing minor, but the Jets didn't even get a power play, since Mark Scheifele was called for slashing. I predict that this will be a five-game suspension. Former Minnesota Wild forward Devin Setoguchi has been signed by the Calgary Flames. It would appear that the Flames got a bargain signing Setoguchi for $750,000. One could make the argument, that his is a smart contract, especially if he recovers from the miserable season that he had last season and scores 20 goals. That would be a big win for the Flames. CGY signs Devin Setoguchi. One year. $750K AAV. Today, the National Hockey League released it's 2014-15 schedule. As soon as the NHL releases their television schedule, I will post some games of interest. Perusing the schedules, I found a few items of interest. My two favorite NHL teams, the Boston Bruins and the Minnesota Wild will meet on October 28, 2014, at the TD North Garden. They two teams meet at the Xcel Energy Center on December 17,2014. The Boston Bruins play the Winnipeg Jets on Friday November 28, 2014 at the Boston Garden. On Friday December 19, 2014 the Bruins play the Winnipeg Jets in at the MTS Centre. The Minnesota Wild and the Colorado Avalanche kick off the regular season with a home-and-home series. This should prove to be interesting, because the Wild eliminated the Av's in the first round of the 2014 Stanley Cup Playoffs. Also, this will be the first meeting between Matt Cooke and Avalanche defenseman Tyson Barrie. Cooke took out Barrie with a dirty leg check. Non Boston Bruins Fans: Why do you hate the Bruins? We had an old saying in football, don't go in the kitchen, if you don't want to get hit. Colorado Avalanche goalie Semyon Varlamov was none too pleased with Winnipeg Jets defenseman Dustin Byfuglien after put his glove in the face of the Av's goalie. It could get ugly next time the two teams play. The two teams play a couple more times in March. s/t the Chicago Tribune. This is a story that I saw on a few of the hockey blogs tonight. Winnipeg Jets defenseman Adam Pardy is checked into the glass by the Blackhawks Brandon Bollig. The glass is knocked out by the Bollig check. Pardy loses his helmet in a scrum to an unruly Blackhawks fan. You can actually see a fan wearing Pardy’s helmet while he’s sitting in his seat, in the tweet below from Chris Kuc’s twitter feed, who’s a hockey writer for the Chicago Tribune. I guess there is a reason they call the United Center the Mad House on Madison. The Fan in question was ejected from the game. Dangerous moment for Winnipeg Jets defenseman Jacob Trouba as he missed a check and was carried off of the ice on a stretcher. As you can see by the video, Trouba attempted to check St. Louis Blues defenseman Jordan Leopold and went face-first into the boards. Trouba was alert and gave the fans a thumbs up as he was being wheeled out on the stretcher. I have seen some horrible officiating, but this one really takes the cake. As you can see from the video, Jets forward Mark Scheifele actually trips himself and the ref assesses Stephen Gionta a two minute minor for tripping. I do expect the NHL officials to do a better job. While I was on my family vacation, I was surprised to see that the Winnipeg Jets resigned former Minnesota Golden Gophers and Boston Bruin forward Blake Wheeler to a 6-year, 33 Million dollar contract. According to Capgeek.com, Wheeler is going to make 5.6 million dollars a year to play for the Jets. Yeah, okay! That seems like a lot of money for a guy that's scored (93g-139a—232pts) in 372 NHL games, he's never scored more than (17g-47a—64pts) in 82 game season. Does anyone see a compliance buyout coming in the future? Congrats to former Minnesota State University Mankato Mavericks head coach Troy Jutting for getting the assistant coaching position at the University of Nebraska Omaha. Last week were were alerted of the impending coaching move by SB Nation Blogger Chuck Schwartz and Bridget Brooks. The University of Nebraska Omaha came out with their "official" press release today. OMAHA, Neb. 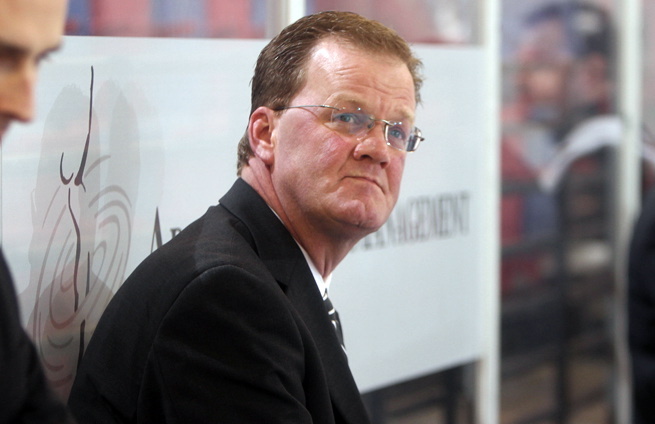 – University of Nebraska Omaha head hockey coach Dean Blais announced today that Troy Jutting has been named the team's new assistant coach. Jutting takes over for Brian Renfrew who left Omaha after one year to take a position with the Winnipeg Jets of the National Hockey League. Jutting is well known to fans of the Western Collegiate Hockey Association, having served as the head coach of Minnesota State for the last 12 years. In reading this World Herald article from Rob White this early departures really doesn't make a lot of sense as well - Jayson Megna who tallied (13g-18a-31pts) didn't exactly stand out last season as one of the top players in the WCHA, but I guess he would like to take his chances on developing in the minor leagues. Rob White, World Herald --- Jayson Megna, the University of Nebraska at Omaha’s second-leading returning scorer, decided to turn pro with one of three NHL organizations and won’t return for his sophomore season. Megna, who attended a development camp with Pittsburgh earlier this month, said he’d decide among the Penguins, Boston Bruins and Winnipeg Jets this weekend. He said he had six or seven offers in all. Megna, who made the WCHA all-freshman team in 2011-12 after recording 13 goals and 18 assists for 31 points, becomes another high-profile offseason departure for a program that slumped at the end of a 14-18-6 season. Megna will be the 12th player this summer from the WCHA to for e-o their college eligibility and sign a professional contract. Megna is an older player at 22 so he won't be going to the CHL route. The Jets Defenseman Dustin Byfuglien has reached a plea agreement and will not be charged with the impaired-boating charge. I think it's a win for the Byfuglien camp. The Winnipeg Jets said that they're happy to have this incident behind them because now Byfuglien can concentrate on just playing hockey. Mike McIntyre, Winnipeg Free Press -- Dustin Byfuglien has resolved his criminal trial in much the same way he's becoming known for playing hockey -- leaving a trail of mystery, debate and controversy in his wake. The talented but sometimes frustrating Winnipeg Jets defenceman walked into a downtown Minneapolis courthouse Monday morning expecting to begin a week-long jury trial. But he skated out of danger less than an hour later, courtesy of a last-minute plea bargain that leaves many questions unanswered, including what prompted authorities to believe he was boating while impaired last summer. Byfuglien pleaded guilty to a misdemeanour charge of careless boating, which pertains only to the fact he didn't have proper lighting on his boat when stopped by police last summer. He was given a $1,000 fine and 30-day jail sentence, of which 28 days were suspended and two days converted to community service work. In exchange, prosecutors dropped more serious charges of impaired boating and refusing a blood or urine test. The suspended time would only be revisited if Byfuglien re-offends during that period.